The morning had been hectic and they were running late because the baby needed a last minute diaper change. Tara needed to get all three kiddos loaded up and to the car pool location quickly, but for some strange reason the back doors of her van would not open. She tried her clicker. She tried the key. She tried jiggling the lock. Anxiousness started to well up in her heart. The kids began to sense the tension and take on the stress for their own. Pressed for time and strongly annoyed, Tara told the kids to get in through the front door and had them crawl back to settle into their car seats. As she started the car she was aware of her agitation and didn’t like it. Then, from the back of the van her eight-year-old theologian son piped up and joined the sacred conversation. From. The. Lips. Of. A. Child. What began as a chaotic and stressful drive to school became a celebration of the presence of God. It was a devotion-on-wheels that began with a door that wouldn't open. A beautiful memory that started with stress but was changed by the grace of Jesus, our Overcomer. Sometimes doors don't open for us. We don’t always get the position we want, the response we want, the admiration we want, or the health we want. But with every closed door comes an opportunity of response. When Tara invited God into her frustration and opened her heart to His presence the tension transitioned to peace. A few minutes after the “stuck door debacle” they arrived at the carpool line to pick up the other children. Tara figured she’d try again. She pressed the button to unlock the back doors, and this time they opened with no resistance. A smile spread across her face as this thought danced in Tara’s mind. If the back doors had opened a few moments earlier, we would've lost the opportunity to celebrate God’s peace and our time of sacred conversation would never have happened. With that in mind she thanked God for the doors that didn’t open as she drove the kids to school. I don’t always respond perfectly in stressful situations. And Tara readily admits that she doesn't either. But when we choose to turn our frustrations and disappointments over to God He gives us the grace we need to experience His peace in the midst of pressure. Lord, Thank You for reminding me that You are dependable, available, and willing to help at all times. Please guide me toward Your grace when I grumble. Teach me to turn to You when I’m stressed so that others would see Your joy and peace in me. Read Psalm 37. What verses in the chapter resonate with your heart today? What doors are not opening in your life that have you frustrated? Grab your journal and a pen and write a prayer of response. Not a journal girl? No worries. Swing over to my blog or Facebook page and write it there! I Want It ALLis now available! 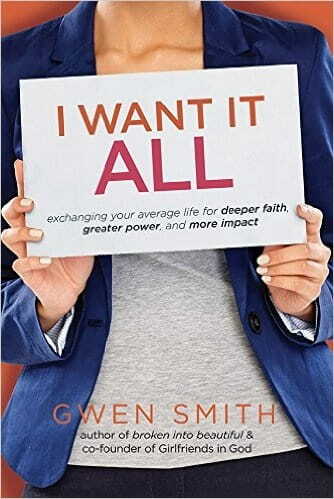 This new book by Gwen Smith will help narrow the gap between average ordinary living and the not-so-ordinary promises of God found in His Word. We are meant to be women of impact who expect great things and move in the power and grace of Jesus. That’s the message of I Want It ALL. Order yours today from Amazon, Barnes & Noble, ChristianBook.comor your favorite retailer.